Status: Rare regular winter visitor west, rare casual central. Documentation: Specimen: UNSM ZM17444, 23 Nov 1996 Wildcat Hills NC, Scotts Bluff Co (Brogie 1997). Taxonomy: Four subspecies are recognized (Gill and Donsker 2017): atratus of northwest Mexico, gambeli of the eastern Rocky Mountains in the western USA, inyoensis of the central Rocky Mountains in the western USA, and baileyae of the Pacific Slope of the Rocky Mountains in the western USA and western Canada. Nebraska records are presumed gambeli. There is an earlier date 21 Aug 1999 at Oliver Reservoir, Kimball Co, and later dates 23 May 1970 Scotts Bluff Co and 25 May 2017 at Chadron SP, Dawes Co. One was banded at Wildcat Hills NC 4 Oct 2012 (Brogie 2013). This species stages irregular irruptions onto lowlands east of the Rocky Mountains, at times reaching Nebraska in small numbers. Most reports are of birds at feeders in Scotts Bluff Co and eastward on occasion, suggesting provenance similar to that of Steller’s Jay, likely the eastern Wyoming forest at and around Guernsey State Park, some 30 miles from Nebraska on the North Platte River. Mountain Chickadee was not reported in Nebraska prior to 1966, when one was reported in Sioux Co 5 Oct (Cortelyou 1967) and another in Scotts Bluff Co 20 Nov-31 Dec. During the ensuing decade, the species appeared in six winters, 1966-67, 1968-69, 1969-70, 1972-73, 1973-74, and 1976-77. Most reports were from Scotts Bluff Co in the period 6 Oct-23 May. Birds were reportedly photographed and banded at Scottsbluff Oct 1968 (Williams 1969), although these photographs have not been published. There is only one documented record from this decade, a single at Gering, Scotts Bluff Co 5 Dec 1976 (Gubanyi 1996). Other localities with reports during these winters were Sioux Co 5 Oct 1966, Lincoln Co 6 Nov 1968-6 Apr 1969 and 16 Nov 1976, and Dawson Co mid-Jan through mid-Mar 1969 (Shickley 1969). The latter, along with one in Gosper Co 13 Mar 2008 (Silcock 2008) are the easternmost records for the state. There were no reports for the following twenty-year period; a single bird was at Ogallala, Keith Co 24 Nov 1995 (Grybowski 1996) and an irruption followed during winter of 1996-97. Up to seven were reported at Stateline Island, Scotts Bluff Co 5-12 Oct 1996 (Brogie 1997) and three were at a Scottsbluff feeder the same day. Several were subsequently noted at Scottsbluff and Gering feeders (Brogie 1997), and up to five were at feeders at the Wildcat Hills NC through 19 Apr 1997. Additional reports were of one at Riverside Park, Scottsbluff, 27 Oct 1996 (Brogie 1997) and a single as far east as North Platte, Lincoln Co 4-6 Dec 1996 (Silcock and Jorgensen 1997). The final reports for the irruption were of singing birds 30 Apr 1997 at Scotts Bluff NM, Long Canyon, Banner Co 3 May 1997, and at Winters Creek Lake, Scotts Bluff Co 4 May 1997. Following the irruption during winter of 1996-1997 there was a series of scattered sightings similar to those of the late 1960s through the late 1970s. There was at least one sighting in eight of the 12 winters 1997-1998 through 2008-2009. Reports during this period included a few outside the North Platte River Valley, suggesting that some birds arrive via the South Platte River Valley or perhaps “cross-country” to the Harrison, Banner Co area from eastern Wyoming. This species does not occur in the South Dakota Black Hills (Tallman et al 2002). One was reported at Harrison during winter 1998-99, but no details were provided; another there 28-30 Dec 2007 for the Harrison CBC was well-documented (Brogie 2009). At least three individuals were at feeders in Ogallala and Brule, Keith Co in the period 19 Dec 2002-12 Apr 2003, and again at an Ogallala feeder 7 Jan-12 Apr 2008 (Brogie 2009). Two were reported at Smith Lake WMA, Sheridan Co, 14 Oct 2005. In fall of 2007 this species moved onto the Colorado plains in some numbers; numbers were also high in Nebraska during winter 2007-2008 with a final tally of 13 including reports away from the North Platte River Valley and east of North Platte. These may have been birds that followed the South Platte River from Colorado: North Platte, Lincoln Co 20 Mar, Johnson Lake, Gosper Co 13 Mar, near Sidney, Cheyenne Co 5 Apr, and 20 Apr in Banner Co. There were no records after 2008-2009 until 2012-2013; each winter since, through 2015-2016, has had records, including at least 15 birds in the Scottsbluff area alone 2012-2013. None were reported in the winters 2016-2017 and 2017-2018. 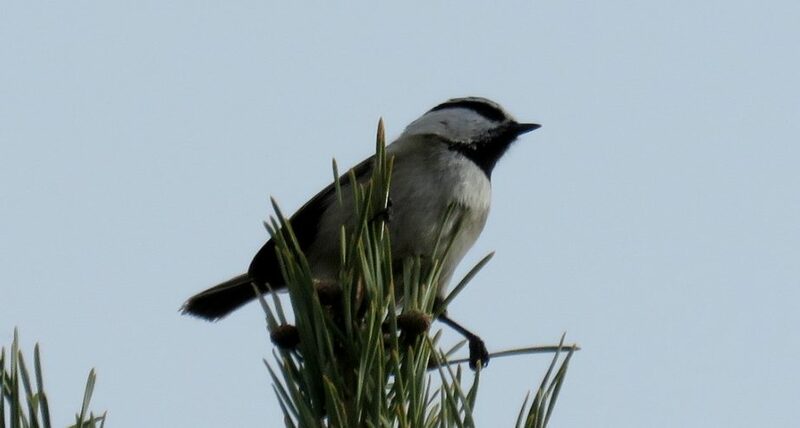 Comments: An intriguing finding was described by Rosche (1974), who found two chickadees in the Wildcat Hills of southern Scotts Bluff Co 18 Jul 1974 which resembled Black-capped Chickadees morphologically but sang Mountain Chickadee songs. Rosche had not heard any Mountain Chickadee songs at the site until he played a tape, at which time the two singing birds appeared. The two birds did not respond to taped Black-capped Chickadee songs. A song “reminiscent” of Mountain Chickadee’s song was heard south of Redington, Morrill Co 27 Jun 2003, about 20 miles southeast of Rosche’s 1974 location. Hybrids were reported in the Laramie Mountains of eastern Wyoming in early Oct 2017 (Cody Porter, post to WYOBIRDS). Phillips (1986) was “aware of no authentic specimen” of hybrid Black-capped and Mountain Chickadees, although the two species apparently hybridize “extensively in Rio Grande valley of central New Mexico (Howe 1985), where Black-capped Chickadees are uncommon at the southwest edge of their range and Mountain Chickadees are casual irruptive migrants from nearby mountains” (McCallum et al 1999). Photograph (top) of a Mountain Chickadee at Scottsbluff, Scotts Bluff County 21 Dec 2014 by Michael Willison. Cortelyou, R.G. 1967. 1966 (Ninth) Fall Record Report. NBR 35: 60-71. Howe, W.H. 1985. Hybridization in Black-capped (Parus atricapillus) and Mountain (P. gambeli) Chickadees in the Middle Rio Grande Valley of New Mexico. Master’s Thesis, University of New Mexico, Albuquerque, New Mexico, USA. Rosche, R.C. 1974. Mixed-up chickadees. NBR 42: 80. Shickley, G.M. 1969. Mountain Chickadees. NBR 37: 64. Williams, F. 1969. Southern Great Plains Region. Audubon Field Notes 23: 492-495.